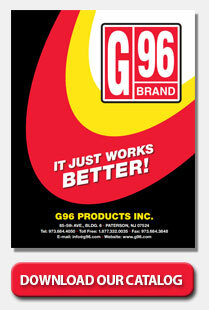 G96 Leather and Boot Waterproofing is a new scientific formula that makes leather waterproof without impairing its breathing characteristics. Maintains leather flexibility at low temperatures and extends life in presence of salt and alkalis. Good for use on old and new leather. Not sticky – leaves leather smooth to touch. Used by skiers, hunters, fishermen, horsemen, garage men, police and outdoor workers. Available in 6.75 fl. oz. aerosol spray cans. This product is not recommended for synthetics or suede. This product contains no chlorinated propellant. Be certain your leather is clean and dry. Spray article evenly but lightly, holding can 8 to 10 inches from article being treated. Allow to dry for 10 to 15 minutes. Be sure to spray soles and seams of shoes and boots being treated. Then rub leather with a small cloth dampened with G96 Leather & Boot Waterproofing. Give article a second coat and let set overnight. Rub down with a soft cloth in the morning.